SWOT is an acronym that stands for strengths, weakness, opportunities and threats, which also makes up the four components of a SWOT analysis. It is used by a lot of individuals and businesses in different fields and industries to help make improvements, identify their flaws and pay attention to factors that can greatly affect them and their business. Many different types of SWOT analysis templates are created and made available right now to cater to the demands of different users of the tool. 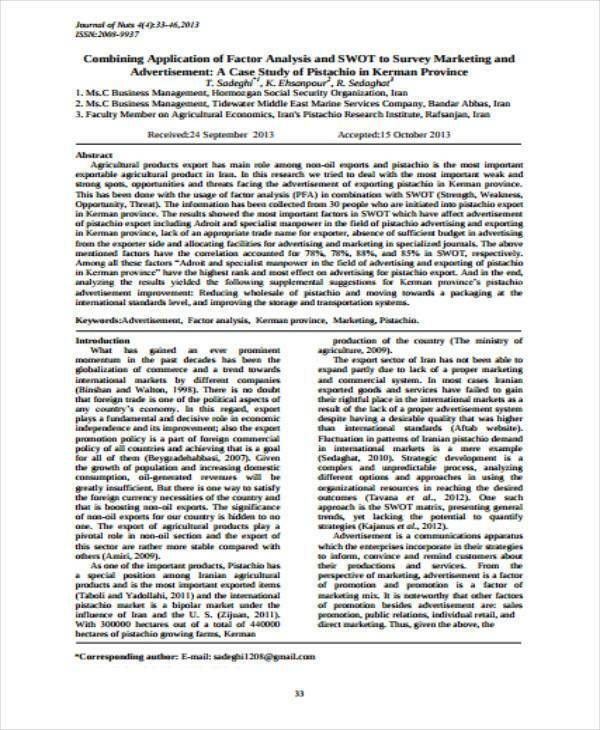 Featured in this article, are advertising SWOT analysis templates. We have also included related and useful information about the topic, like what it is, its uses and the advantages, why it is important and many more. 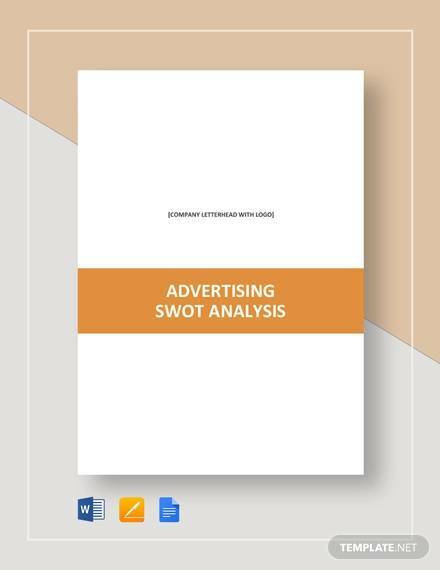 What Is a SWOT Analysis for Advertising? Advertising is a form of marketing communication where messages that are no personal are conveyed to a large number of people in order to introduce, promote and sell ideas, services and a wide array of products. Everyone can advertise, but ti takes skills, experience and expertise to be able to advertise effectively and successfully. This is where the need for advertising agencies and advertising services has started. With the increase in sales and boost in popularity of products and services being advertised in various mediums, advertising together with marketing has become popular since then. Advertising agencies or businesses need to take care of themselves, too to attract more clients and build good business relations with them. To do this, it it is necessary that they conduct a SWOT analysis for advertising. Through a SWOT analysis, they will be able to identify internal factors (strengths and weaknesses) and external factors (opportunities and threats) that has an impact on their business. Through the analysis, they can identify existing problems with their advertising agency or business, and find ways on how to appropriately and effectively address these problems. Strengths refer to strong points or on things that your business is doing good at. This includes, expertise when it comes to advertising, having good relations with other businesses or with business partners, low debt, good track record and lot of borrowing power. A good organizational structure and culture, including finance and human resources, also counts as one of the strengths of the agency or business. The weakness of an advertising agency or business includes the lack of expertise in the field of advertisement and marketing, lack of people or staff in the agency like lack of graphics designer, being associated with companies or clients selling low-quality products and services or those that are difficult to differentiate from other similar products and services. Determining the weaknesses of your business may not not be a pleasant task, but it will greatly help you find out where and what you are lacking so that you ca further improve. Another way of fighting the weakess of your business is to examine and analyzing where they excel. This is one of the external factors that affects a business. This means that they are way out of your control. However, you can still choose to take advantage of these opportunities in order to help you and your business achieve your desired goals and objectives. The internet is one examples of an evolving opportunity for an advertising agency where they can market themselves as well as their clients’.You may also look for growth opportunities and expansion opportunities for the coming years. Just like opportunities, you have no control over the threats that may hinder your advertising agency from achieving its goals or from moving forward. But identifying threats and paying attention to them will help you avoid circumstances and decisions that may threaten your business. Threats include market conditions that continue to fluctuate, changes in business legislation and many more. 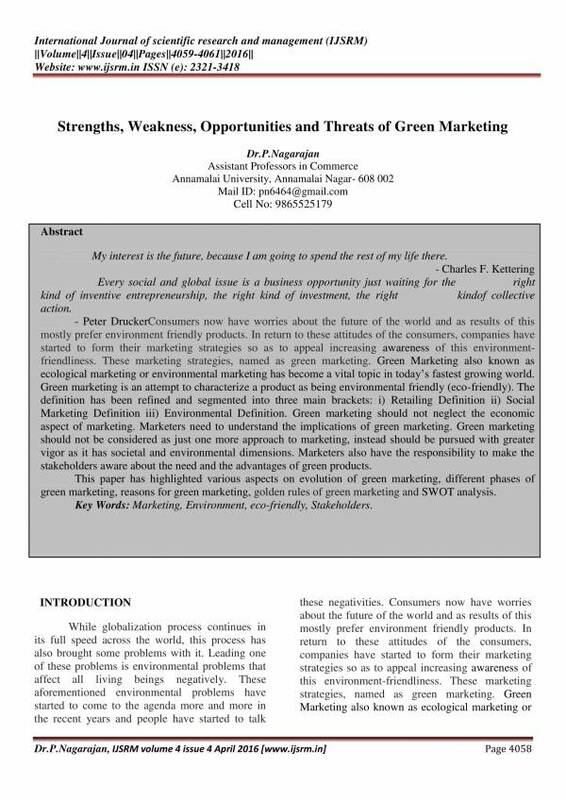 Other related articles you may want to check out are Marketing SWOT Analysis Samples & Templates, Business SWOT Analysis Samples & Templates, and Sample Employee SWOT Analysis Template. 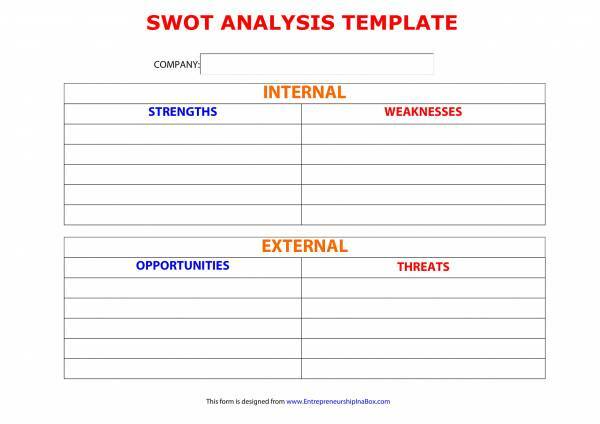 Have you seen a SWOT analysis template before? A SWOT analysis template mainly consists of the four components namely strengths, weakness, opportunities and threats. Most templates include a table with four columns, or a square or rectangle that is equally divided into four. Each component is assigned to each of the four parts and the data gathered during examination is recorded to their corresponding columns or parts. 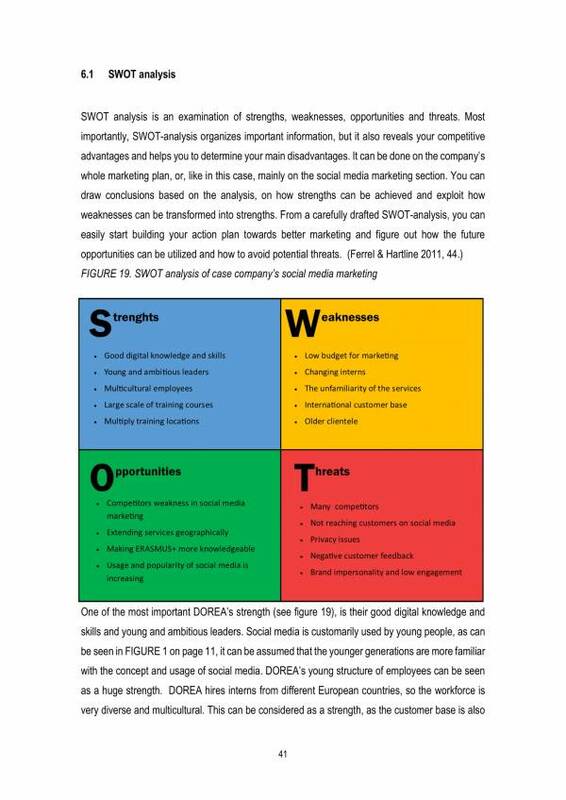 Here are some of the uses of a SWOT analysis template. 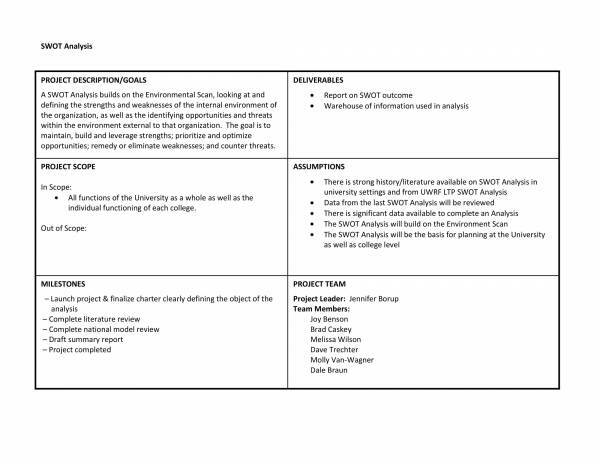 A SWOT analysis template is used to document and record the data gathered during investigation or examination so that they will not forgotten or lost. A SWOT analysis template is used to organize the gathered data and make sure that they are separated or categorized accordingly. This way identification of the data gathered can be easily done and it makes the process easier. 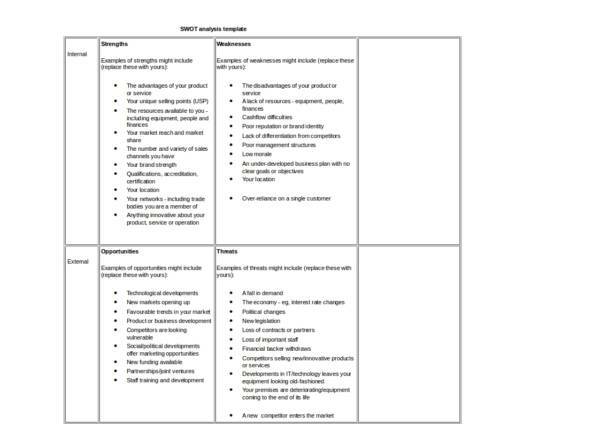 A SWOT analysis template can be used as a reference or as a guide when making one’s own SWOT analysis template. Most templates include the basic components but there are some that provide tips and instructions on how to best use it. 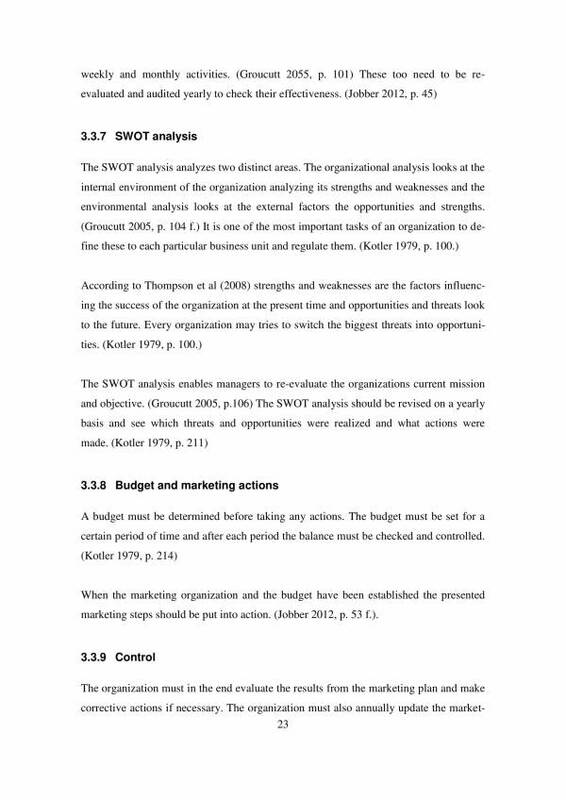 A SWOT analysis template is used so that there is uniformity in the tool being used during analysis as well as have uniformity in the data being gathered and viewed. A SWOT analysis template is also used as a study material or visual aid when teaching or learning about SWOT analysis. 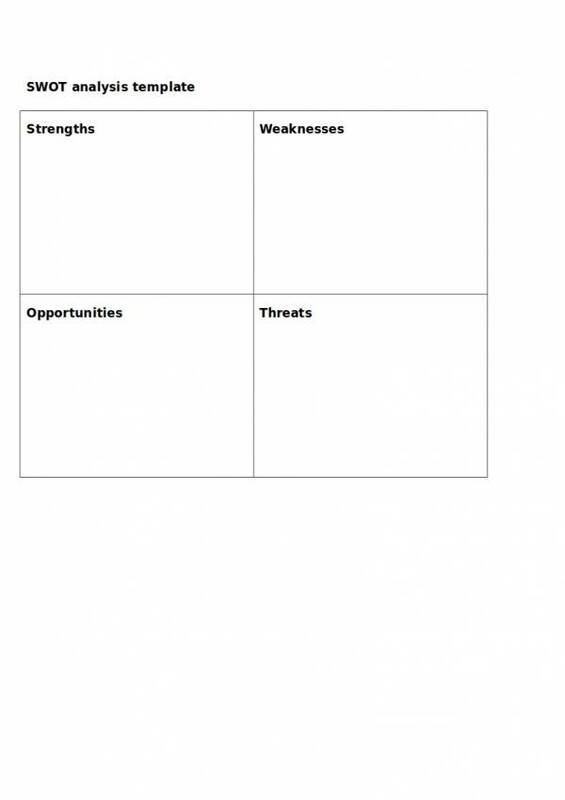 A SWOT analysis template is a pretty simple tool and it is also really easy to use. SWOT analysis templates for different purposes are available on our website, like Customer Service SWOT Analysis Template, Competitor SWOT Analysis Samples & Templates, and Manager SWOT Analysis Samples & Templates. Why SWOT Analysis Is Important for Strategic Business Marketing? A SWOT analysis is a really simple method of analysis but still it is of great importance in most businesses. 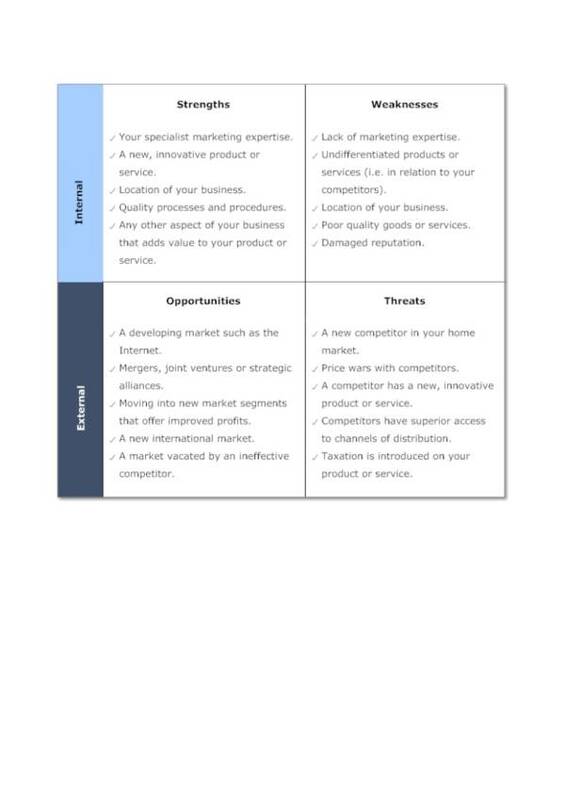 There are a number of reasons why a SWOT analysis is given importance in business, specifically in strategic business marketing. It is because through a SWOT analysis significant factors that can positively and negatively affect a business can be identified. Identifying these factors will help the business focus on the positive ones and improve the negative factors to turn them into something useful. Also, it helps a business determine the presence of factors that will help aid in achieving specif goals and objectives that the business has set. Similarly, the analysis also helps determine obstacles to overcome to get the outcome or results that the business desires. To help you understand more about SWOT analysis templates and other templates in general, here are some of the advantages that every template offers its users. 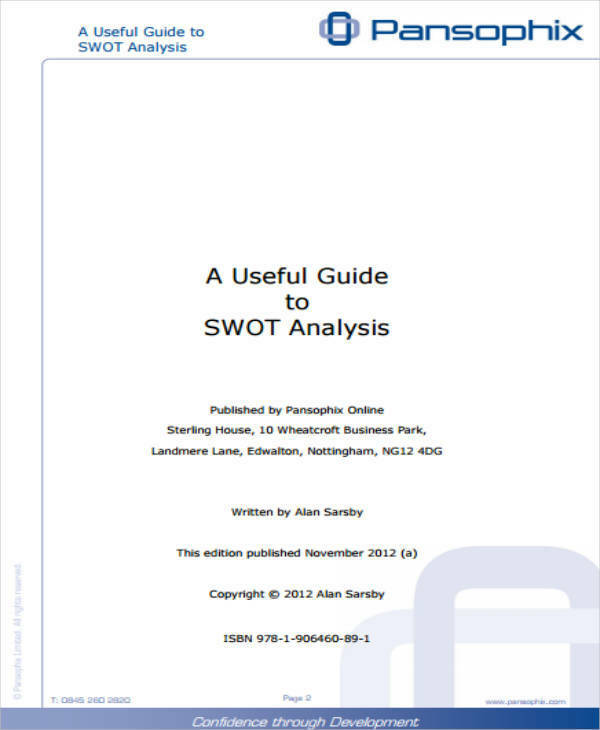 A SWOT analysis template includes a complete set of details that are all necessary in the creation of a SWOT analysis. 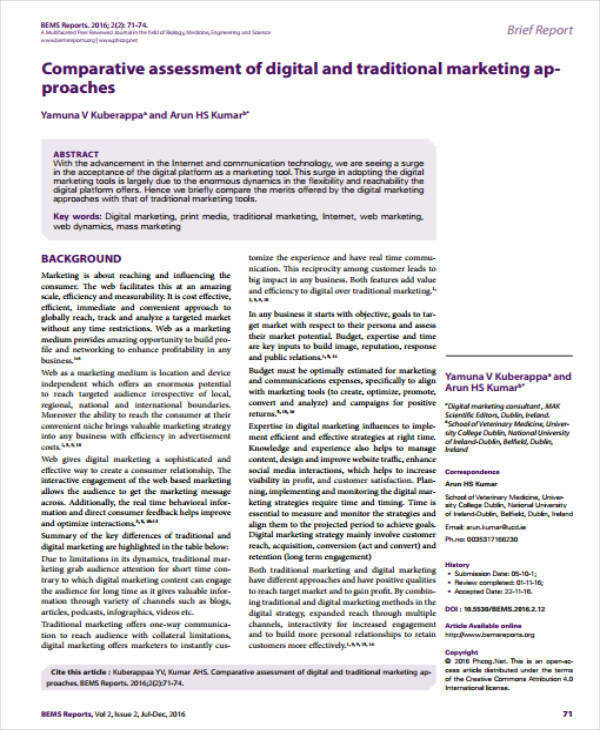 It is also required when reporting about the details of the analysis ad serves as a main source of data. 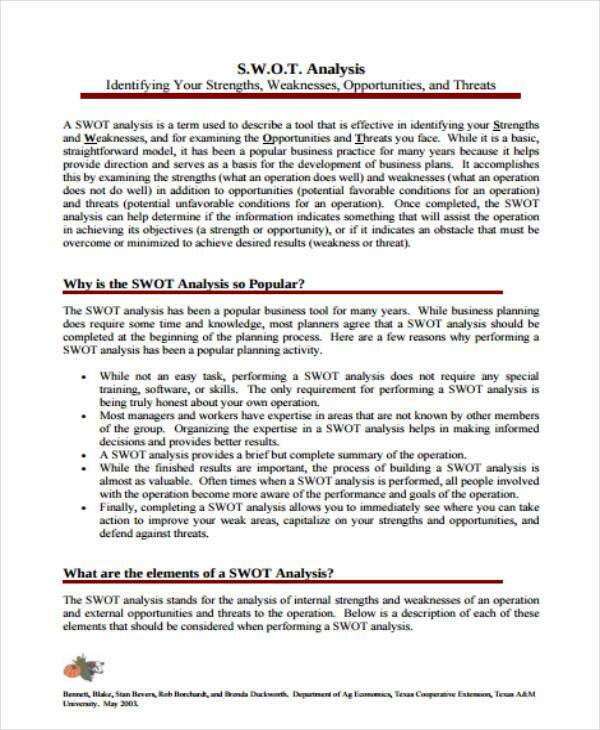 Using a SWOT analysis template allows a business to save on money and resources for two reasons. The first one is that it is available online and are mostly offered for free in a lot of websites. The second reason is that the template eliminates the need to hire somebody to design or come up with a SWOT analysis template that your business can easily acquire online. The template has been made available in a lot of different file formats, including those that are familiar to us, like PDF, Word and Excel. This way you can choose the file format that you need. These templates are also editable and printable. You can edit or change some parts of the template that is not related to or that is not appropriate to what you are doing. Once you have successfully made the necessary changes you can proceed with printing them. Using a SWOT analysis template also eliminates the need for you to create a whole new document for the same purpose which saves you more time and brainpower that you can use on other more important things or tasks. 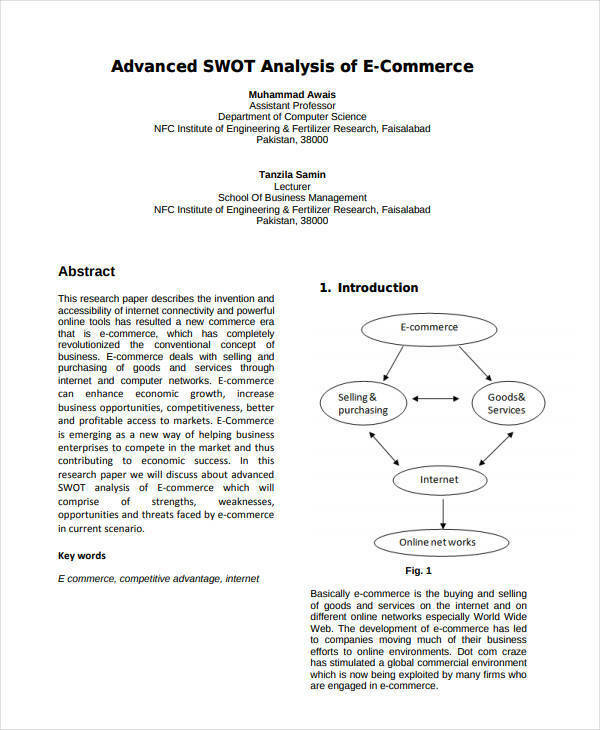 SWOT analysis templates are also very easy to find and they are mostly available online. The templates are also very easy and convenient to use. When using a template, all you need to do is download the template of your choice, open the downloaded file and then fill in the details on the required fields or the on the blanks. 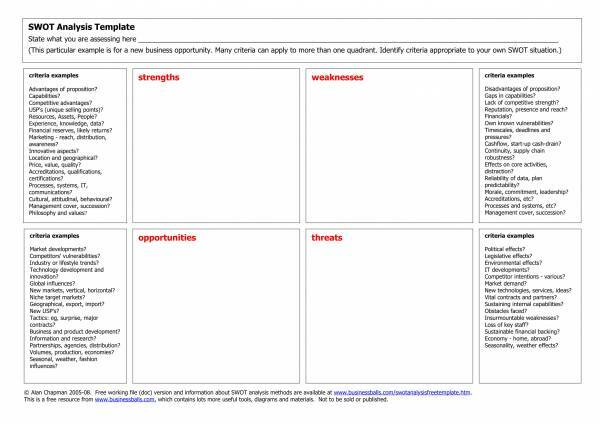 Have you used a SWOT analysis template or any other forms of templates before? If not, then now is the right time to use them. Look at all those amazing advantages. You can check out a collection of these templates on our website, like Professional SWOT Analysis Templates, HR SWOT Analysis Samples & Templates, and Retail SWOT Analysis Samples &Templates.